In April, the S&P 500 (TR) gained 0.4%, ending its first consecutive monthly loss in almost two years, but the index is still down 0.4% year-to-date (ending April 30, 2018.) Mid caps are also down for the year, -1.0%, after the S&P 400 (TR) lost 0.3% in April. However, Small caps pushed into positive territory, up now 1.6% year-to-date, from the S&P 600 (TR) gain of 1.0% in April. Overall, 6 of 11 sectors gained in large and mid caps while 8 of 11 gained in small caps. 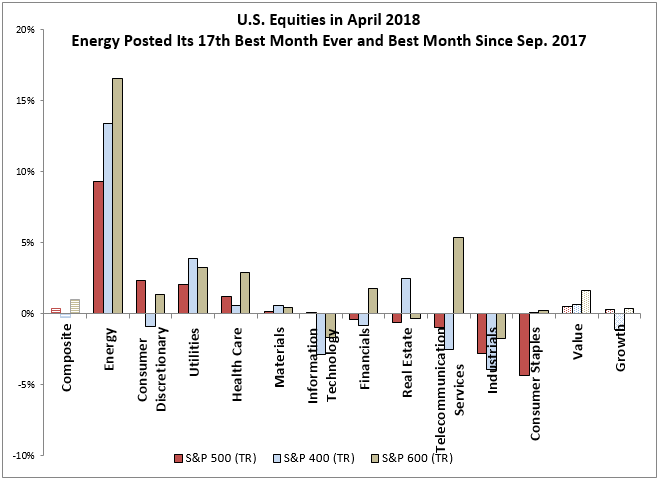 Energy led the gains across the size spectrum with total returns of 9.4%, 13.4% and 16.6%, respectively in large, mid and small caps that more than tripled the next best sector’s returns (S&P 500 Consumer Discretionary gained 2.4%, S&P 400 Utilities gained 3.9%, and S&P 600 Telecommunications gained 5.9%.) It was the S&P 500 Energy’s 17th best month on record since October 1989, and it gained most since Sep. 2017. Consumer Staples posted its 28th worst month in history, losing 4.3%, making it the 3rd consecutive monthly loss and worst 3-month loss (-12.5%) since the 3 months ending in Feb. 2009. Energy’s outperformance not only propelled small caps to outperform large caps (since smaller energy companies rise more with oil) but drove value to outperform growth. The S&P 500 Value has 12.5% more energy than the S&P 500 Growth, which has nearly none. 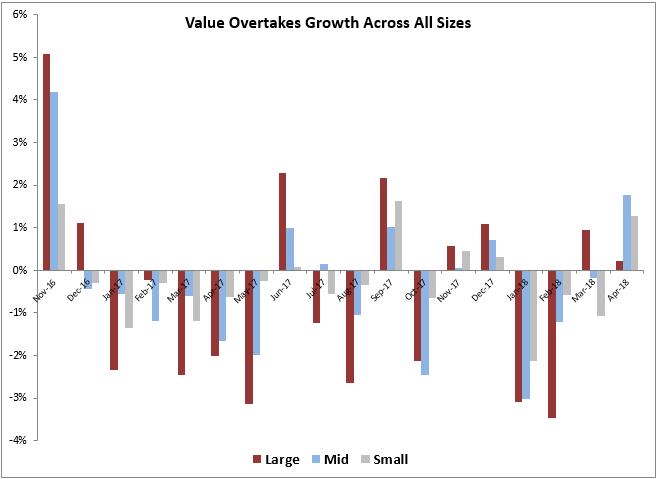 While the value outperformed growth across all sizes for the first time in 2018, the mid and small caps had a much greater premium (respective 1.8% and 1.3%) than the large cap premium at 0.2%. The mid cap premium was the most since Nov. 2016 and the small cap was most since Sep. 2017. It is also the first time large cap value outperformed growth for 4 of 6 months since the second half of 2016. 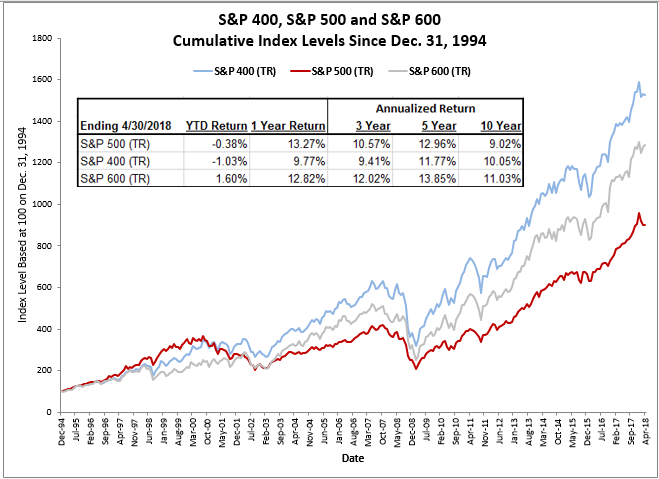 As shown at the end of 2017, when growth and large caps outperform as much as they did in 2017 (that was the most since 1999,) the trend reverses. That’s what seems to be happening now.